When Immanuel was 2 year old, his parents, Mr. Punithan, an auto-driver and Mrs.Rebecca of Madurai, Tamilnadu, India, noticed he had frequent fever and bleeding from his gums. On 8th December 2009, a blood test revealed that Immanuel had leukemia—a form of blood cancer. "That was the worst day of our lives," said Punithan. "We were devastated. The day they told us, I couldn't hear, I couldn’t see - I just shut down." 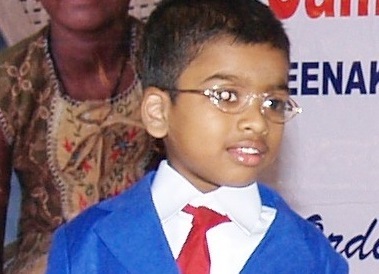 He was then transferred to the pediatric oncology ward in Meenakshi Mission Hospital and Research Centre, Madurai. Immanuel underwent almost one year of intensive chemotherapy, most of which was given as outpatient—except for the first month. Some weeks, he received chemo for four days in a row, and some of his treatments lasted up to eight hours at a time. Today, Immanuel's leukemia is in remission and he has completed all of his intensive chemo cycles and moved to the less intensive maintenance stage of his treatment, in which he needs to take just two different types of pills; and he needs to visit the oncology clinic only once a month until he finishes his three years of treatment. His parents are thankful to every donor who helped their son’s treatment and for having access to the experts like Dr. Jayabose and Dr. Priya and his team at the Camila Cancer Centre.